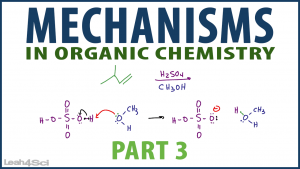 Organic chemistry is all about mechanisms. And while the sheer volume may feel overwhelming, they all boil down to a few simple types of mechanism steps. In Part 1 and Part 2 we looked at the four common mechanism types: Nucleophilic attack, Loss of Leaving Group, Proton transfer and Rearrangements. In this video we’ll look at TWO complete mechanisms to identify the patterns for each steps mechanism type. First, you’ll see a step by step mechanism of an SN1 reaction of 2-butanol with hydrochloric acid. Next, you’ll see an alkene reacting with sulfuric acid and methanol! This is Video 3 in the Mechanisms Series. Click HERE for the entire series.